The Henry’s Fork of the Snake River, named after Andrew Henry known for discovering and exploring the area in the early 1800s, is arguably one of the finest trout streams in the lower forty-eight states. In fact Trout Unlimited voted the Henry’s Fork the number one stream in the country. The upper section of the Henry’s Fork is formed where Henry’s Lake Outlet, a lightly fished meadow stream bound by willow trees, meets Big Springs, the primary source of water to the Henry’s Fork. Downstream from where the Outlet is joined by Big Springs, the Henry’s Fork flows past Mack’s Inn and Upper Coffee Pot Campground. This portion of the river is primarily a put-and-take fishery containing mostly smaller trout. This area is also a popular recreation spot for rafting and canoeing. Further downstream larger rainbows can be found in the productive pocket water of Coffee Pot Rapids. Fall fishing can be quite exciting here when large rainbows follow spawning Kokanee out of the reservoir. Below Island Park Reservoir the Henry’s Fork flows into the famed Box Canyon. This short 3 1/2 mile stretch of river produces some of the best fishing you will find anywhere on the river. This fast flowing section is primarily nymphing water due to an abundant food supply consisting primarily of stonefly nymphs. From the bottom of Box Canyon the river slows as it flows thru the community of Last Chance and Harriman State Park. This section of the Henry’s Fork, most famous among dry fly fisherman the world over, is known for large rainbow trout, beautiful sunsets, prolific hatches, and perfect presentations . Fish this area in mid-June and you might find twenty-inch rainbows gorging themselves during a green drake hatch. Below Harriman State Park the river picks up speed again near Riverside Campground as it drops into Cardiac Canyon. From the campground to the Hatchery Ford takeout, you’ll find approximately 4 miles of deep runs and pocket water with some class 2 white water rapids. Like the Box Canyon this section can produce good numbers of rainbows with some of the largest fish being taken out of some of the deep runs. The Hatchery Ford takeout is the last easy access before Lower Sheep Falls and Mesa Falls. The section of river below Lower Mesa Falls may be the most scenic and least-fished portion of the river. Rainbows and browns can be taken here in good numbers and size. Access is limited due to steep canyon walls and floating this stretch is advisable only for the experienced oarsman. From the confluence with Warm River to the Ashton Reservoir the Henry’s Fork becomes more easily fishable with lots of deep pools, riffles and good of access. Excellent dry fly fishing can be found in the many back eddies and current seams. Large populations of rainbows and brown trout reside here making this one of the most diverse sections of the river. From the Ashton Dam to St. Anthony the Henry’s Fork consists mostly of long riffles and runs. This section fishes best early and late in the season, good hatches in June and July can produce some of the best dry fly fishing on the river. Open all year, the hearty angler willing to brave the cold during March and April can get in some great early season fishing. 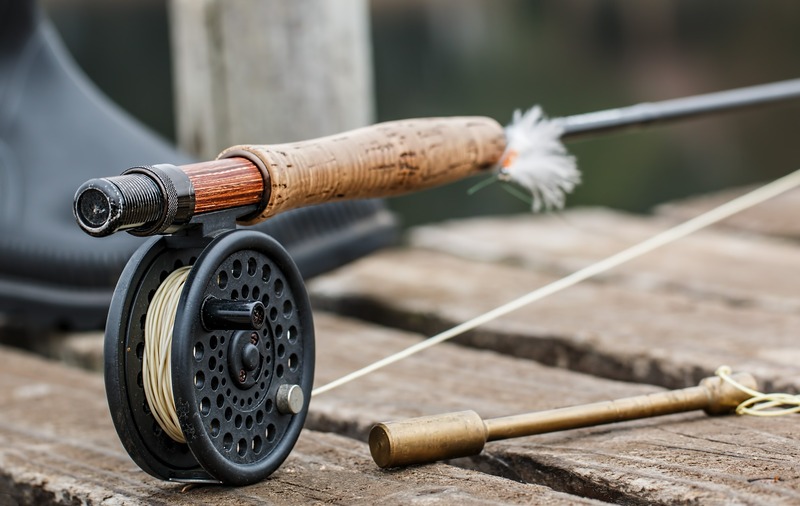 Island Park can provide you with all of your Fly Fishing needs on the South Fork of the Snake or Teton River. Rowing Clinics and Fly Fishing Guide Schools are also offered throughout the season. Please give us a call for more info. We do not email on a regular basis.